Just three months after launching a full-blown ad business, Instagram is kicking things into another gear, announcing today that marketers can utilize 30-second videos in campaigns. Before, ads were capped at 15 seconds—the same length of video that users can post. The new video ads can be posted in landscape mode to support the app's recent formatting update. By upping the video for 30-second creative, Instagram said in a statement that the move will "give ads a more cinematic feel." The longer format should be appealing to brand marketers who are used to creating 30-second ads for television. Longer video formats show how seriously Instagram's parent company, Facebook, is taking video advertising in order to compete against YouTube and premium video ad networks. Additionally, as part of Instagram's new ad push, brands will be able to target the promos to specific groups of consumers, like they can on Facebook. Adaptly is an ad-tech company that gained access to Instagram's API late last month and has started selling ads to its clients. Sean O'Neal, president of Adaptly, said that 30-second spots should fare well on the app, based on his company's initial tests. "We are seeing impressive results from the 15-second ads, with overall costs and performance metrics being competitive with the larger, more established video platforms," O'Neal said. "We fully expect that the 30-second format will deliver similar, industry-leading results." Still, shorter video tends to perform better online, meaning that marketers have to work harder to convince consumers to spend a little bit more time in the app. Plus, the extra costs from shooting both horizontally and vertically adds up, pointed out Amy Peterman, 360i's director and paid social practice lead. "Publishers who offer versatility for format allow creative teams more leeway to consider options," she said. "Shooting videos in horizontal and vertical perspective ads production costs, so we'll need to evaluate the cost related to uplift in performance." The video-based ads build on successful campaigns brands have seen with Instagram's other tools, including swipeable carousel ads and call-to-action buttons promoting messages like "Shop Now" for retailers and "Install Now" for app-download campaigns. 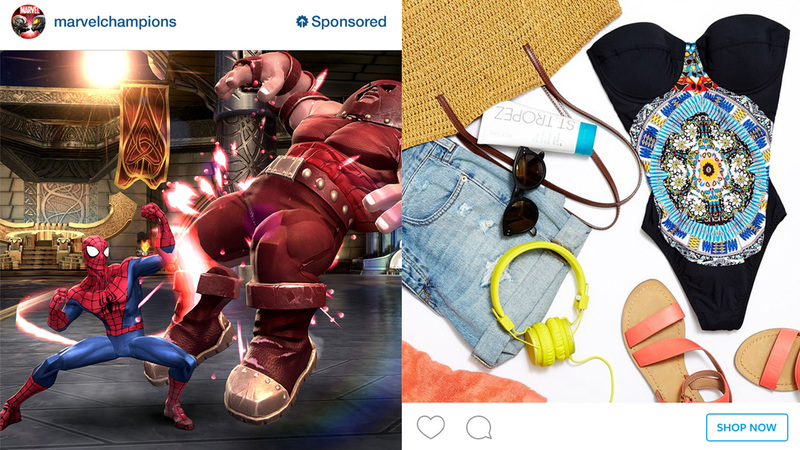 Instagram claimed the ads are working by citing a couple of case studies. Deals marketer Gilt Groupe evidently saw an 85 percent lift in shopping app installs after running a campaign that promoted downloads, and game maker Kabam got people to spend unusually high amounts of time in its Marvel Contest of Champions app. "People come to Instagram for visual inspiration, and advertising on Instagram has the power to touch, inspire and move people," Instagram said in a blog post. "Instagram ads have proven to drive strong branding results—97 percent of measured campaigns on Instagram have generated significant lifts in ad recall." In yet another move by Instagram, the photo-sharing app is launching a premium-priced format called Marquee, which will let brands run ad blitzes for short periods of time. Instagram did not say how much much Marquee will cost compared to a regular ad buy. Fox is the first brand to run a Marquee campaign, which launches today to promote five of its fall shows—including The Grinder, Scream Queens and Grandfathered. Scream Queen first airs Sept. 22, while The Grinder and Grandfathered debut Sept. 29. Check out the creative for Fox's new campaign below.